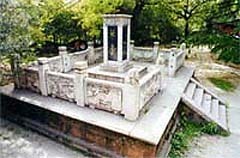 The Ancient Lute Pavilion was first built in Northern Song Dynasty. The present one was rebuilt in the Qing Dynasty. On the stone stele in the center of the pavilion is the half-length statue of Yu Boya. On the pavilion are written four Chinese characters "gaoshan liushui", meaning high mountains and flowing waters. They refer to an anecdote of two understanding friends in ancient times. Legend goes that one day 2,000 years ago when Yu Boya, a musician who traveled by the Hanjiang River, was playing the lute under the moon light by the riverside, the music attracted Zhong Ziqi, a woodcutter who was once official in charge of music and knew music well. Zhong praised the sublime music of Yu and they were extremely happy to encounter great friends and made an appointment to meet right there the next year. Unfortunately, Ziqi died of illness the following year. Yu Boya was so sad that he wouldn't live without his friend. He played once again the music in front of Ziqi's tomb before breaking it into pieces. The story has been widely spread among the folks and people use "high mountains and flowing waters" to refer to those bosom friends that understand each other well.